AN ADVANCE IN HOME RECORDING POD Studio UX1 combines the stunning sounds of POD Farm plug-in with a powerful USB interface. POD Farm plug-in..
POD Studio UX1 combines the stunning sounds of POD Farm plug-in with a powerful USB interface. 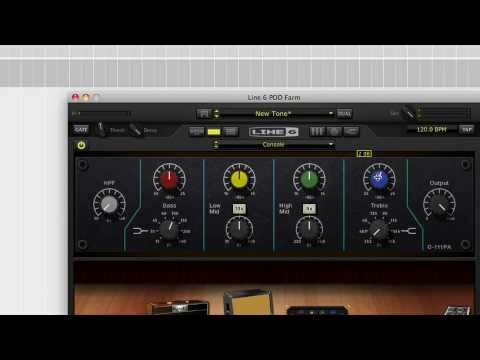 POD Farm plug-in features every model necessary for pro-sounding tracks. Over 80 immortal and fully adjustable guitar amps, bass amps, preamps and more, from vintage classics to must-have modern monsters, are packed inside to deliver legendary POD tone to your DAW. UX1 is a rock-solid interface that provides advanced home recording in an easy-to-use package. The balanced XLR input and high-quality mic preamp produce clean and clear vocal tracks. And the essential ins and outs provide a truly pro recording experience. Key Features: Lowest noise for recording guitar (12dB more dynamic range than similar interfaces) Exclusive latency-killing ToneDirect monitoring Up to 24-bit/96 kHz recording POD Farm plug-in (Mac AU/RTAS/VST and Windows RTAS/VST) 18 immortal guitar amps with 24 cabs 5 thumping bass amps with 5 cabs 29 stunning stompboxes and studio effects (instantly increases to 64 with included FX Junkie model pack!) 6 warm and colorful mic preamps Ideal for use with Ableton Live, Cubase, Logic, Garageband, Pro Tools, Cakewalk and other pro recording platforms Includes Ableton Live Lite Line 6 Studio Edition 8-track recording software and RiffWorks T4 recording software for instant pro recording and idea capture right out of the box USB 1.1 and 2.0 compatible.